The illegal harvest amounted to nearly 20 percent of the total allowed harvest of the sea creatures statewide, said U.S. Attorney Annette Hayes, and did serious damage to the Puget Sound. 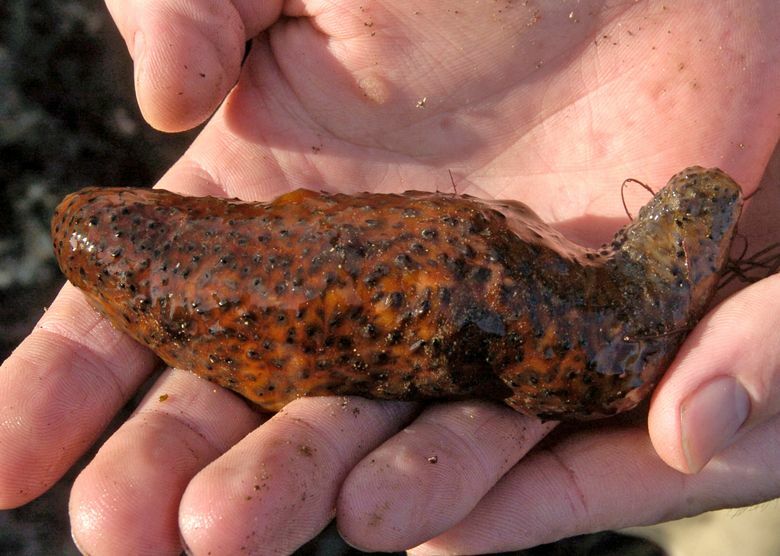 The owner of a Washington seafood company has been sentenced to two years in prison for overharvesting sea cucumbers and must pay $1.5 million in restitution — the second large bust of illegal sea-cucumber trade in the U.S. West in just over a year. Hoon Namkoong, 62, was also sentenced Friday to three years of post-prison supervision. He pleaded guilty earlier this year in U.S. District Court in Seattle to underreporting the number of sea cucumbers he bought from tribal and nontribal fisheries in the Puget Sound by nearly 250,000 pounds between 2014 and 2016. His company, Orient Seafood Production, then sold them to seafood buyers in Asia and the U.S.
Sea cucumbers, which are shaped like cucumbers with small feet and measure up to 6 feet, are echinoderms, a family that includes starfish and sea urchin. They are served dried or fresh and often braised with fish, vegetables and traditional Chinese sauces. They are sought to treat various health issues and are increasingly in demand in China and southeast Asian countries. Harvesting sea cucumbers is permitted in the United States and many parts of the world, but with limited quantities and only during high season. Illegal trade is becoming increasingly common and lucrative. Last year, federal officials filed charges against a father-son partnership for allegedly smuggling more than $17 million worth of sea cucumbers to the United States and exporting them to Asia. The pair was accused of buying the illegally harvested animals from poachers in Mexico’s Yucatan peninsula and then shipping them overseas after bringing them across the border in San Diego. According to court records, in the recent Washington case, Namkoong bought Puget Sound sea cucumbers from both tribal and nontribal fishers over three seasons. Sea-cucumber harvests are regulated by Washington state and tribal authorities and are tracked by fish tickets signed by both the fisher and the purchaser. As part of his plea, Namkoong said he falsified fish tickets over three seasons and frequently paid fishers in cash so there would be no financial record of the total amount of sea cucumbers taken. Those actions are a violation of the Lacey Act, a federal law that prohibits illegal trafficking in wildlife, fish and plants.